Tempos Interessantes’ Man of the Year 2017 is KIM JONG UN! The man rattled the world all year round. He dared the United States, faced up to China, scoffed at South Korea, ignored Japan and showed utter contempt for the United Nations, especially the UN Security Council Resolutions. He resisted sanctions, military exercises, military threats, provocations, isolation, diplomatic forays and overtures, rants, pleas and ever more sanctions. And he went on testing nuclear weapons. And he went on testing ballistic missiles. And he tested a thermonuclear device. And he wrapped up the year testing an ICBM apparently capable of striking New York and Washington D.C. He relishes it and he boasts of it. He is Kim Jong Un, Tempos Interessantes’ Man of the Year 2017. A man who leads a small, poor, isolated and widely despised and/or hated nation, but nevertheless manages to challenge the powers-that-be and carry on with his plans, is certainly deserving of a nomination for a person who was successful and influential in the current year. The secret for Kim’s success (here measured against his objectives) lies on his determination, shrewdness and ruthlessness, as well as, on his opponents’ mismanagement and misperception of North Korea. 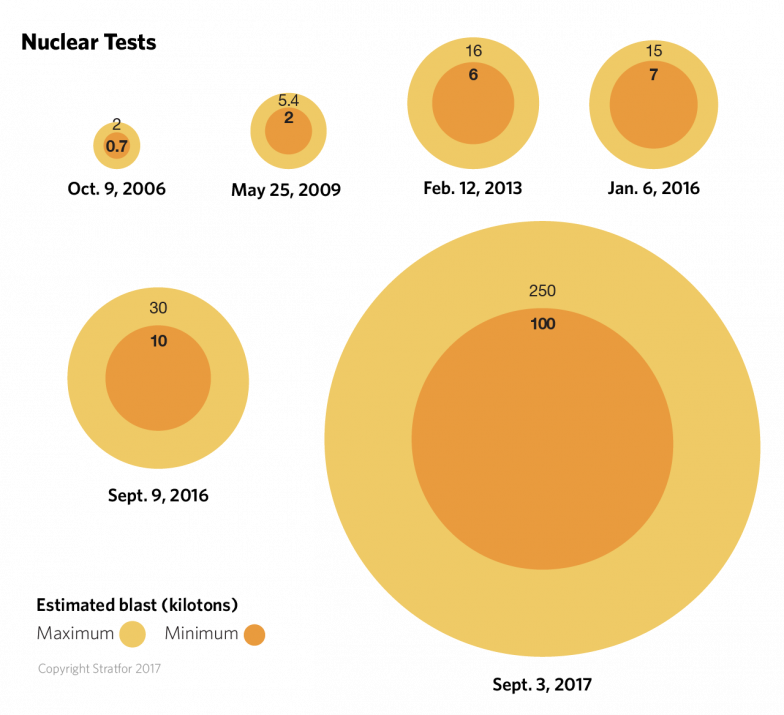 From 2006 to 2017, the relentless sequence of increasingly powerful nuclear tests. Starting with the latter, the grossest evaluation was considering Kim a raven lunatic, a maniac bent on random destruction, a loose-cannon with no real perception of reality that was racing towards self-destruction. In the words of US Senator John McCain, he is “a crazy fat kid”. Kim Jong Un, as Tempos Interessantes has alerted over the years, is none of it, as the events have been proving. Then, there was this long held belief that North Korea wanted nuclear weapons to unleash destruction over South Korea, or, at least, blackmail her into submission (unification under the aegis of Pyongyang). This is outright silly, but there are still people standing by it. Then, there was, there is and there will be the conviction that North Korea will eventually buckle down under the pressure of sanctions. This is like trying something that fails repeatedly and still thinking you are right. Praise to those who still can devise new (and useless) sanctions. There is also the twin faith in US military pressure and Chinese political and economic influence to make the DPRK backtrack. It has been 11 years since the first nuclear test and… just keep the faith. Last but not least, there is the surrealistic demand that North Korea dismantles her nuclear programme, one of the best examples of a non-starter. A country, a regime, a leader, commit themselves to achieve a nuclear power status against all odds, come hell or high water, and then, when the goal is well within reach, if not attained yet, they would just throw away their prize, what they regard as their life insurance? Good luck with that. 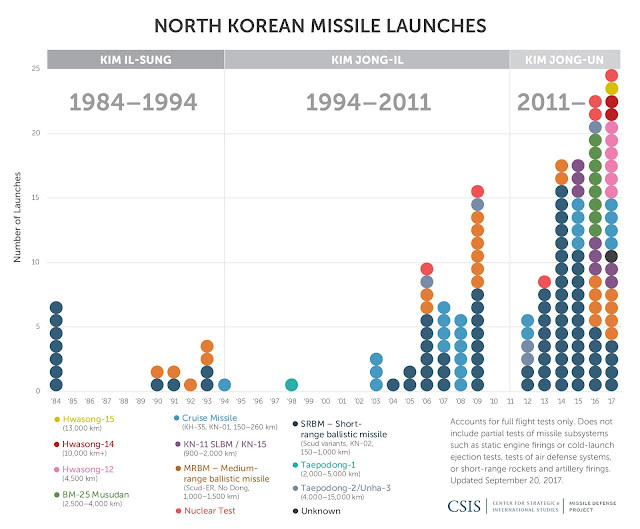 North Korea’s missile launches from 1984 to September 2017 under the three Kims: Kim Il Sung, Kim Jong Il and Kim Jong Un. Only in 2017 there were 20 missile tests. Going back to the former, Kim Jong Un, following the steps of his forebears, has skilfully managed the interactions with the great powers, drawing on their fears, prejudices, interests and objectives to get the most out of each, or to sow discord between them. 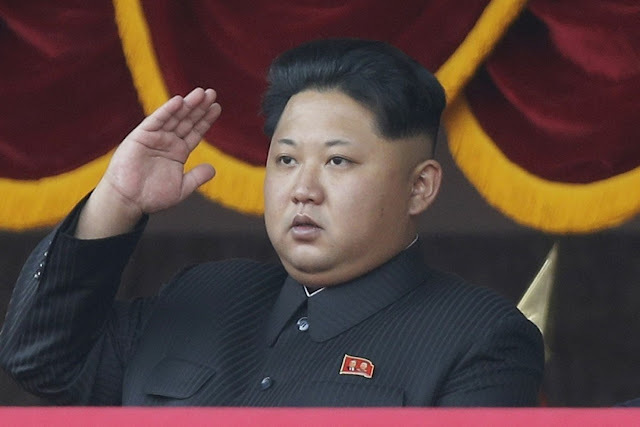 Accordingly, he conditioned China’s punishments of North Korea because of Beijing’s fear that, if the regime collapsed and the country unravelled, China would be flooded with refugees, the Korean Peninsula would plunge into instability or chaos, the DPRK could be absorbed by South Korea and there would be American troops just across the Yalu river from China. Kim’s seemingly rash and aggressive posture terrified South Korea, fearful that, if hard pressed, the North would unleash hellish artillery and rocket fire over Seoul. Besides, even without an attack, the prospect of a North Korean collapse gives the shivers to the South Korean government. The Americans mostly feared a North Korean ICBM capable of striking the continental United States, but they also got entangled in East Asia complex of interests, perceptions and fears. On top of it, their fear is becoming real. So, playing the lunatic role, Kim managed to deter more aggressive measures from his antagonists who reasoned that “the man is crazy, so he is bound to do crazy things.” Well, it turns out he is not. Of course, being the ruthless leader of a totalitarian state helps. There is no opposition, no protests, no accountability; the hardship that most people suffer just has to be submissively endured. Moreover, despite being young and supposedly inexperienced, Kim could read the writing on the wall. Like Bashar Al Assad in Syria, he took due notice of the fate of Saddam Hussein in Iraq and Muammar Kadhafi in Libya. And both realised that resisting and fighting back (Assad), or acquiring the ultimate deterrence (Kim) could shield them from American regime change adventures and from US sponsored personal termination. From the moment the regime decides that nuclear deterrent is vital to its survival, the obvious outcome is that it will do everything necessary to achieve it. This is the key to understand the reason why this poor country has engaged in such a costly endeavour, why Kim does not slow down and much less give up, why sanctions do not work and also why North Korea will not use the nukes unless she perceives an existential threat. The nuclear weapons North Korea has been developing and amassing are not conceived to start a war. They are North Korea’s deterrence against her enemies, or prevention against a perceived major threat. Period. The bottom line is, if one leaves North Korea in peace, she will not use her nukes. Going forward, North Korea has virtually achieved her nuclear programme’s main goals. There is certainly still room for improvement (there are doubts about the performance of the re-entry vehicle), but the fundamental features, a thermonuclear device and an ICBM, have been achieved. Against all odds, the major powers were defeated and they will have to put up with North Korea as the 9th nuclear power on earth.